Do you ever feel like your day is so busy, that you barely have time to prepare and eat lunch? 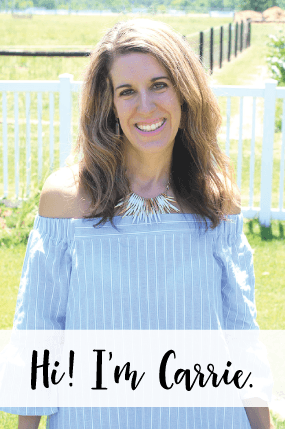 Today I’m sharing The Busy Mom’s Guide on How to Stay on Track at Lunch Time, so that you make good and clean decisions for lunch while still having time to sit down and enjoy it. 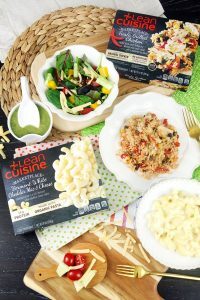 I’m also sharing my quick lunch secret and how LEAN CUISINE® and/or STOUFFER’S® FIT KITCHEN® brand frozen entrées make a delicious and easy solution for eating well. Hover over the image above to start shopping LEAN CUISINE and/or STOUFFER’S FIT KITCHEN brand frozen entrées. My main goal this year has been to eat healthier and I love that LEAN CUISINE and STOUFFER’S FIT KITCHEN offer favorable entrées that can keep me on track. You’ll find meatless, high protein, gluten-free or made with organic ingredients in the freezer section at Walmart. These entrées are delicious and offer an easy solution for eating well. Vegetarians and vegans (or those that try to limit meat consumption) can find it challenging to find quick and easy meal options that work for them. Are you active and need a high protein diet? You may get tired of protein shakes and chicken, but these entrées are the perfect quick solution and give a little variety. There are two types of people in need of gluten-free options: those who view gluten-free entrées as healthier and those with medical conditions that take gluten off their menus. In either case, finding convenient, flavorful entrées can be a real challenge, but LEAN CUISINE and STOUFFER’S FIT KITCHEN® offer quick and easy solutions. Whenever given a choice, I always go for organic. Organic ingredients tend to be cost prohibitive, especially when compared to their non-organic counterparts, but not with LEAN CUISINE® and STOUFFER’S® FIT KITCHEN®. Walmart Online Grocery Pickup has really helped me to stay on track at lunch time. I plan out our meals every weekend and then I schedule a pickup time on Monday morning after I drop the kids off at school. 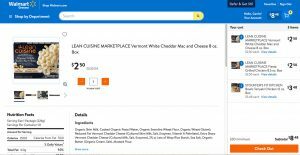 It is so easy and quick, plus I can easily add in some LEAN CUISINE and/or STOUFFER’S FIT KITCHEN brand frozen entrées to my online cart for a quick and simple lunch solution on one of my busier days. I purchased the LEAN CUISINE Vermont White Cheddar Mac & Cheese, LEAN CUISINE Fiesta Grilled Chicken and STOUFFER’S FIT KITCHEN Teriyaki Chicken Bowl. Picking up my groceries with Walmart’s Online Grocery Pickup is so easy. 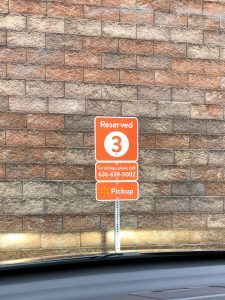 You look for the orange signs and follow them to the pickup area. Then, park by one of these signs and dial the number on it. They’ll bring your groceries out and load up your car for you. This has saved me so much time! Another way I stay on track at lunch time is that I drink a lot of water throughout the day. This helps me to stay full longer and water has so many health benefits. I’ll add some fresh lemon juice to my water to give it a little flavor. Sometimes I’ll fill up a fun pitcher in the refrigerator and see how much water out of it I can drink each day. Then, I set out a glass of water on the table when I eat my lunch. It’s so important to stay hydrated with water and I find that when I drink water, I grab healthier lunch and snack items to complement with it. In the photo above, you’ll see that I’m enjoying the LEAN CUISINE Vermont White Cheddar Mac & Cheese that has no artificial colors, flavors, or preservatives, is meatless and has no GMO ingredients. It has a lot of protein, 14g! 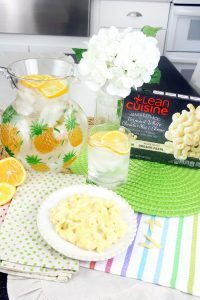 It is made with organic cavatappi pasta complemented with a rich Vermont white cheddar cheese sauce. One of my other favorite entrées is the Gluten Free: LEAN CUISINE Fiesta Grilled Chicken. It has no artificial colors, flavors, or preservatives, is made with natural chicken (raised without added hormones) and has a whooping 19g of protein! This Mexican dish has tender white meat chicken, lightly seasoned rice, black beans and vegetables in a delicious Mexican-style cream sauce. Delicious! My last few tips for how to stay on track for lunch time when you’re busy is to set out a big bowl of fruit on the table. I usually include oranges, a different kind of apple each week, grapes, strawberries and even a banana or other items that are in season at the time. I can never pass up a fresh piece of fruit over chips or even worse (a candy bar!) when I know how much better my body will feel afterwards. Prepping healthy sides for your lunches is important and I always keep a tub of cut up lettuce, salad toppings (cherry tomatoes, cucumbers, etc. ), cheese and a healthier dressing in my fridge. I like to buy shredded rotisserie chicken from the deli at the grocer, because it is so easy to keep in the container all week long in the fridge and I can add it to salads and other recipes. My last tip is to eat lunch SITTING down! I can’t tell you how many times I will ‘work’ during lunch, taking photos for a blog post I’m working on or I’ll grab a bite here or there while I’m putting away laundry or cleaning. Or, I’ll sit down at the computer and eat. It’s best to take some time away from work and focus on just eating, if possible. What do you do to stay on track at lunch time when you’re busy? 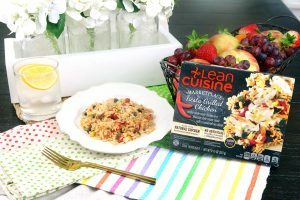 Be sure to check out LEAN CUISINE and/or STOUFFER’S FIT KITCHEN for healthier and easier lunch options!